(Nanowerk News) Researchers have levitated a tiny nanodiamond particle with a laser in a vacuum chamber, using the technique for the first time to detect and measure its "torsional vibration," an advance that could bring new types of sensors and studies in quantum mechanics. The experiment represents a nanoscale version of the torsion balance used in the classic Cavendish experiment, performed in 1798 by British scientist Henry Cavendish, which determined Newton's gravitational constant. A bar balancing two lead spheres at either end was suspended on a thin metal wire. Gravity acting on the two weights caused the wire and bar to twist, and this twisting – or torsion - was measured to calculate the gravitational force. 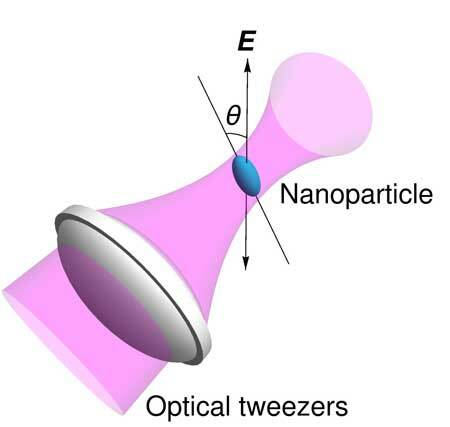 In the new experiment, an oblong-shaped nanodiamond levitated by a laser beam in a vacuum chamber served the same role as the bar, and the laser beam served the same role as the wire in Cavendish's experiment. "A change of the orientation of the nanodiamond caused the polarization of the laser beam to twist," said Tongcang Li, an assistant professor of physics and astronomy and electrical and computer engineering at Purdue University. "Torsion balances have played historic roles in the development of modern physics. Now, an optically levitated ellipsoidal nanodiamond in a vacuum provides a new nanoscale torsion balance that will be many times more sensitive." Findings are detailed in a paper that appeared on Thursday (Sept. 15) in the journal Physical Review Letters ("Torsional Optomechanics of a Levitated Nonspherical Nanoparticle"). "This is the first experimental observation of torsional motion of a nanoparticle levitated in a vacuum and represents a very sensitive torque detector," Li said. "In principle, we could detect the torque on a single electron or a single proton." The paper was authored by Purdue postdoctoral research associate Thai M. Hoang; student Yue Ma from Tsinghua University in China; Purdue graduate students Jonghoon Ahn and Jaehoon Bang; Francis Robicheaux, a Purdue professor of physics and astronomy; Zhang-Qi Yin, an assistant research fellow at Tsinghua University; and Li. The paper details the detection of torsional vibration, a proposal to use the technique for torque sensing and also to achieve torsional "ground state cooling," which could aid efforts to study quantum theory and realize potential applications in quantum information processing and high-precision measurement for sensors. This cooling reduces "noise" caused by vibrating molecules and atoms, making it possible to precisely measure torque and probe the relationships between motion and electron "spin." Electrons can be thought of as having two distinct spin states, "up" or "down," and this phenomenon might be used in future quantum simulations. The paper includes experimental and theoretical portions. "Experimentally, we observed torsional motion, and the theoretical part is a proposal of how to cool down the motion to achieve quantum ground state," Li said. The nanodiamonds are about 100 nanometers in diameter, or roughly the size of a virus. Future research will include efforts to achieve ground state cooling.